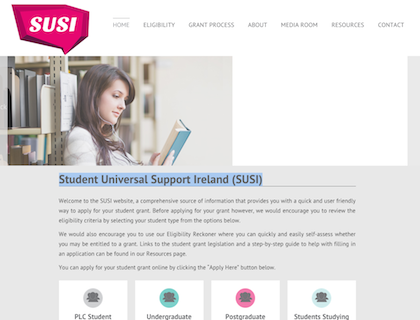 SUSI is Ireland’s single national awarding authority for all higher and further education grants. Student grants are divided into maintenance grants, fee grants and the postgraduate contribution. The grant is available for eligible students in approved full-time Third Level education in Ireland. SUSI offers support to all types of students, from Undergraduate to Postgraduate Students and PLC Students. To check your eligibility and to begin the application process, go to www.susi.ie and make your on-line application.